I have reviewed imPress Press On Nails before and truthfully I wasn't blown away but a lot of it was due to the small size of my natural nail and my lack of faith in any press on nail. 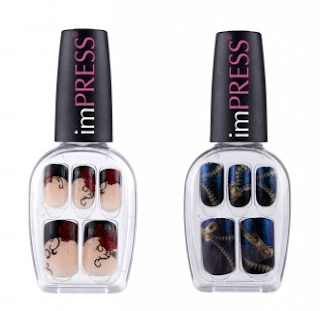 What I will say is that the designs tend to be a lot more fancy and carefully designed than your typical press on nail and should they fit your nail bed it seems you are on to a winner if other bloggers results are anything to go by. The whole concept of the imPress Press On Nail is that you have a no fuss false nail that is easy to apply and remove all the while being hard wearing enough to last a full day - in some cases a few days. If the idea of fast and easy long yet funky nails appeals to you then you may want to keep your eyes peeled for the new Halloween designs. Truthfully I think the Halloween sets will be more of a success than the regular line as we all tend to be a little bolder and dare I say it fun come All Hallows Eve and even if you don't dress up this is a funky way to tap into all things spooky. To the best of my knowledge there will be six designs to choose from with rather amusing design names such as Elm Street ha! Look out for these spooktacular (sorry, not sorry) in your local Boots and Superdrug. I love these designs, these sound like great nails! I have small nails too but the designs look cool so maybe I'll go check them out! Eeek I think these designs are a bit tacky. I do actually like impress nails though - there's a couple of colours I buy fairly regularly for times when I need a speedy mani. They need to sort out their colour range though! I have the opposite problem, my nails are normally too wide for stick on nails! I like the cobweb and rose designs, but the others are a bit weird.. I love impress nails! My nails are usually too long for them, but they have come out with different sizes so I can't wait to try them out! and these designs are so pretty!